Looking for a Eureka Staff Attorney to work collaboratively with other staff to provide exceptional legal services in all areas of Federal Indian law. California Indian Legal Services is a statewide, tribally controlled, non-profit corporation that provides legal services to Indian tribes, Indian organizations and low-income individual Indians on issues involving Federal Indian Law. CILS provides a variety of legal services including brief counsel and advice and extended representation on core legal issues affecting Native Americans and Indian tribes. CILS is involved in litigation, policy analysis and advocacy and also provides transactional services to tribes involving economic development and tribal infrastructure. CILS has four offices throughout California. Our Sacramento office provides legal services in 7 counties that include 18 of the 110 federally recognized tribes in California. Additional information about CILS may be found on our website, at www.calindian.org. Supervised by the Directing Attorney, the Staff Attorney will work collaboratively with other staff to provide exceptional legal services in all areas of Federal Indian law. Our fast-paced office provides legal services on issues of jurisdiction, tax, estate planning, trust assets, environmental law, natural resource development, tribal governance, employment and the Indian Child Welfare Act. The Staff Attorney will assume a varied case load that may include: brief counsel and services to low-income Indian individuals; state and federal court litigation; contract negotiation; advising tribal clients; developing and implementing constitutions, codes, and policies for tribal clients; making presentations; and ICWA related dependency cases. California bar membership in good standing. Demonstrated knowledge of Federal Indian law with at least 1-2 years of experience practicing law. Excellent communication, writing and organizational skills. Strong work ethic and able to work nights and weekends when many tribal councils meet. Ability to travel and a valid driver’s license. A commitment to providing high-quality legal services for Indian people. Ability to work independently, as part of a team and to take initiative. Familiarity or experience working with Indian individuals, tribes or Indian communities. The California Supreme Court recently invalidated a rule of court compelling counties to enroll tribal children in pre-ICWA dependency cases but affirmed Social Service’s obligation to assist in enrollment after an Indian child finding has been made. The case, which is cited as In re Abbigail A., Ct.App. 3 C074264 originated in Sacramento County. Rule of Court 5.482(c) required counties to apply “active efforts” to enroll children before being deemed an Indian child and compelled the agency to “secure enrollment” after a tribe responds that a child may be eligible, but before eligibility or enrollment has occurred. Sacramento County objected that the rule essentially put the cart before the horse and applied the Act (and its active efforts standard) in advance of an ICWA finding. The state high court agreed and held that Rule of Court 5.482(c) exceeded state and federal statutory language. By contrast, Rule of Court 5.484(c)(2) defines the actions that constitute “active efforts” and includes requiring the county agency to assist in enrolling Indian children who are eligible for membership. Social Services, by stepping into the parents’ shoes, already assume a number of legal responsibilities for dependent children such as enrolling them in school, health care, and special education. Facilitating tribal membership is also one of those duties. This is significant because the agency usually possesses documents that tribes need to enroll a minor, such as birth certificates and social security cards. The facts in Abigail A. were complicated by the fact that the minor’s father was not enrolled in the Cherokee Nation of Oklahoma. Both the lower court’s record and the Tribe stated that the minors could not be enrolled until the father’s membership was completed. Sacramento County argued that this created a new class of ICWA children, ones who may be eligible but whose parents had not perfected tribal membership. The rule was designed to capture the in-between period after a tribe notifies the court of eligibility, but before the paperwork can be completed. Rule of Court 5.482(c) authorized the lower court to treat those cases as if they were Indian children and mandated that the agency expedites securing enrollment. In striking down Rule 5.482(c) the Court did not preclude application of the ICWA once a child has been deemed eligible and a finding has been made that a child is defined as an Indian child for purposes of the ICWA. In other words, if a child is found to be an Indian child the Act applies, but during the period before that finding is made, the rule (which was invalidated) cannot require a substantive application of the ICWA. Nothing in the decision appears to excuse the agency’s ongoing obligation of notice and inquiry, and the ruling does not exempt Social Services from its duty to assist in enrolling Indian children after the ICWA finding has been made. In only its third opinion on the Indian Child Welfare Act, the California Supreme Court issued its In re Isaiah W. ruling regarding a parent’s forfeiture of the right to appeal ICWA violations. Isaiah W. involved a mother’s tardy appeal of the Act’s notice and inquiry provisions. The mother, Ashlee R., failed to appeal ICWA’s application at a dispositional hearing and was permanently foreclosed from raising the notice (and substantive application) violations at a later stage. Under California law the “dispositional hearing” is treated as a final judgment for dispositional issues and must be appealed within 60 days, or else any objections are waived. The appeal rule in California appeared to be inconsistent with the ICWA’s continuing duty to give notice, and to make an inquiry, and a tribe’s right to raise ICWA violations at later hearings. 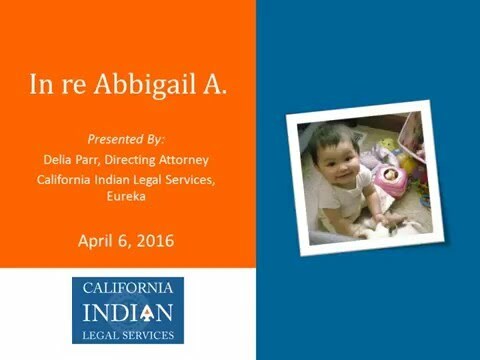 California Indian Legal Services, along with the United States filed Amicus Briefs supporting the mother’s continuing right to appeal ICWA errors. The dispute in Isaiah W. was arisen after the mother informed the juvenile court that her son may have had Native American ancestry, but Court nevertheless found ICWA inapplicable and did not order the social service agency to notice the specified tribes or the BIA. The mother did not object to the Court’s inaction, and never appealed the juvenile court’s dispositional order. Later, the mother did appeal the ICWA non-notice, but not until the final Dependency stage, which is called the Selection and Implementation Hearing. Isaiah’s mother’s appealed occurred after the order was made terminating her parental rights, on the ground that “the juvenile court had reason to know Isaiah was an Indian child yet failed to order the Department to comply with ICWA‘s notice requirements.” The Court of Appeal denied her challenge because, under Dependency procedural law, Ashlee R. should have appealed after disposition. The California Supreme Court’s July 7, 2016, decision acknowledged the Agency and Juvenile Court’s continuing duty of notice and inquiry, and did not preclude a parent from appealing a juvenile court order—even if the dispositional issues were subsumed, or included in a subsequent order terminating parental rights.” The 6-1 ruling reaffirmed the juvenile court’s continuing, and ongoing duty to inquire whether a child is an Indian child, or eligible for membership. (1) Indian tribes have interests protected by ICWA that are separate and distinct from the interests of parents of Indian children, and parents cannot waive a tribe’s rights. (2) The affirmative and continuing duty of inquiry belong to the Court, not the parents, and that duty is not excused after 60 days elapse. An earlier finding of insufficient data did not relieve the Court and Agency of its inquiry and notice obligations. (3) Notice is the cornerstone of a tribe’s participation in an ICWA case, and the law was clearly written to protect the integrity and stability of Indian tribes despite the potential for delay in placing a child, while being mindful of a child‘s need for a permanent and stable home. The Supreme Court’s opinion impliedly recognized that the Agency and the trial court, as well as the parents, have a role and obligation in the inquiry process, but did not incentivize delay in making inquiry or notice. Although the dissenting opinion was correctly concerned about the effect on a child’s need for permanency and a stable home, a parent’s failure to perfect an appeal does not give the Agency an open-ended pass on compliance. On balance, this decision is consistent with many tribes’ interpretation of the ICWA, but it is the first time the state Supreme Court has weighed in on the issue. To the extent that the lower court imposed a one-strike-and-you’re-out rule on appeals of ICWA violations, this Court acknowledged a parent (and tribe’s) continuing ability to appeal notice and other types of non-compliance. Should you have any questions about the ruling please feel free to contact any of our California Indian Legal Services field offices, or contact us by email. [mradoff@calindian.org; dparr@calindian.org; mvezzola@calindian.org]. 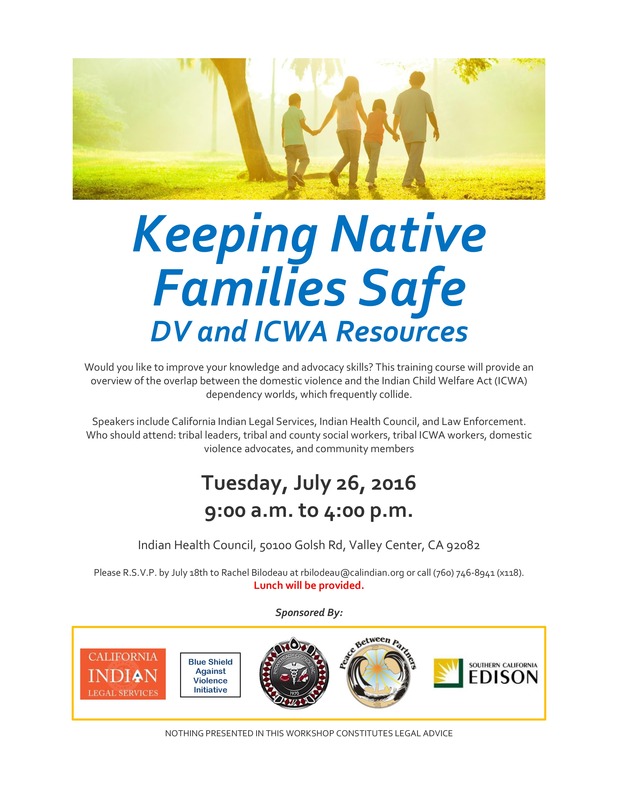 CILS in conjunction with Indian Health Council is presenting a training entitled Keeping Native Families Safe – DV and ICWA Resources. This training course will provide an overview of the overlap between the domestic violence and the Indian Child Welfare Act (ICWA) dependency worlds, which frequently collide. Tribal leaders, tribal and county social workers, tribal ICWA workers, domestic violence advocates, and community members are invited to attend. 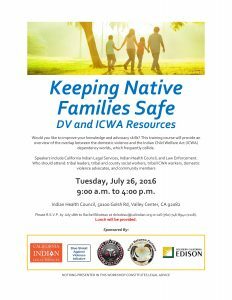 Join us on Tuesday, July 26, 2016, 9:00 a.m. to 4:00 p.m. at Indian Health Council, 50100 Golsh Rd, Valley Center, CA 92082. Lunch will be provided with the training. Please R.S.V.P. by July 18th to Rachel Bilodeau at rbilodeau @ calindian.org or call (760) 746-8941 (x118). This training is sponsored by Southern California Edison, Blue Shield Against Violence Initiative, Peace Between Partners, Indian Health Council and California Indian Legal Services.